Tutorial: Settings is Better Than Options and Here's Why. 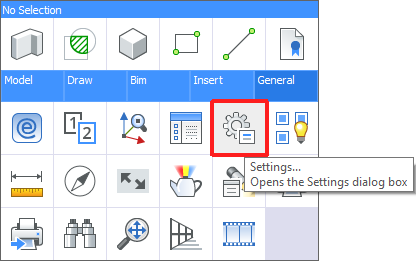 BricsCAD centralizes all system variables and user preferences in a single dialog box called Settings. If you like to type, you can access the Settings dialog box with the OPTIONS or DSETTINGS commands. If you prefer graphical access, you’ll find the Settings tool in the General command group on the Quad. 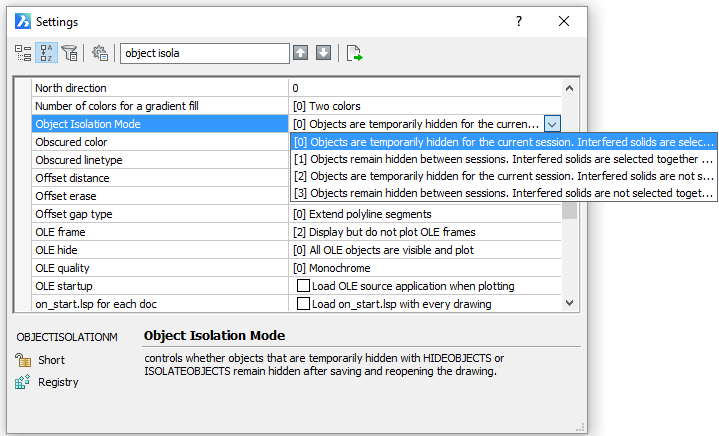 Tools in the Settings dialog box enable you to find and edit the 900+ system variables and user preferences in BricsCAD. You can even export all them and their values to a CSV file. Below those tools is the list of settings. And, at the bottom, you’ll find useful information about the selected setting. 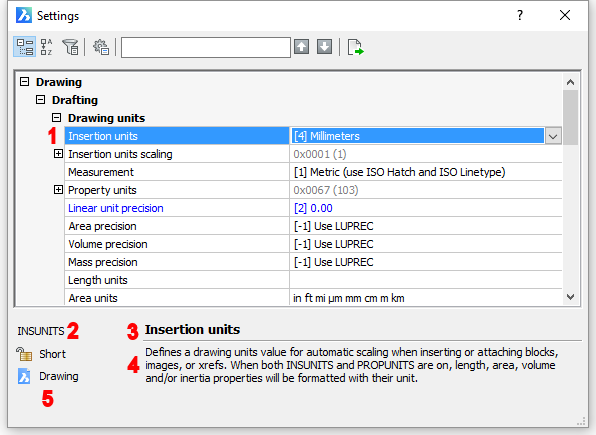 : Most settings correspond to AutoCAD variables. 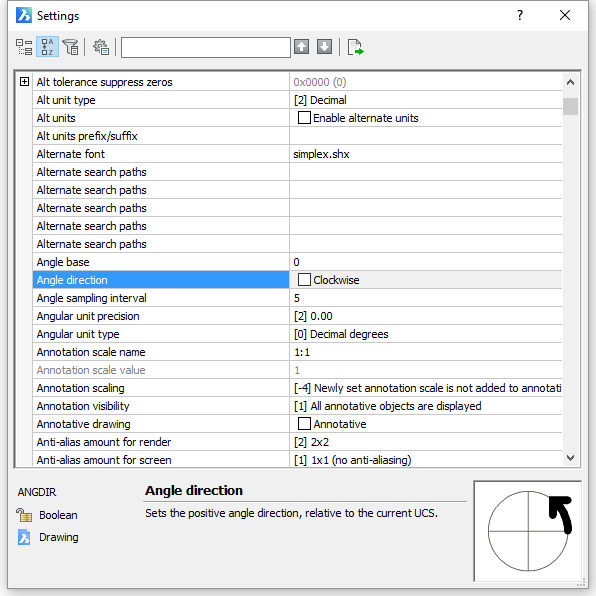 There are, however, a few that are unique to BricsCAD. They are clearly indicated by an additional icon. The Categorized tool displays a tree view that groups the variables into the various categories. You can expand each category to access relevant variables. And, in many cases, you can expand additional subcategories. If you know the name of the setting you want to modify, you may prefer to display the settings instances rather than categorically. Doing so lists all the settings alphabetically based on their Title. The title is different from the actual variable name. For example, Angle direction controls the ANGDIR system variable. Only settings which are different from the defaults are listed in this view mode. Click the Configure icon ( ) on the Settings toolbar. 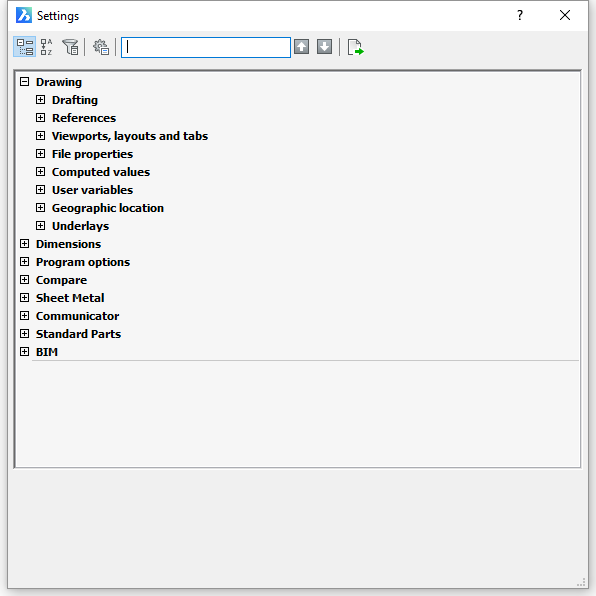 The Configure Settings Dialog allows you to control how BricsCAD searches for settings and how modified settings are listed when the Differences view mode is selected. 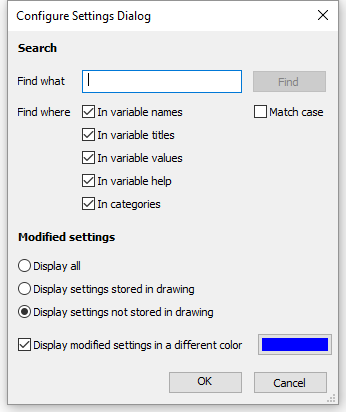 (option) Open the Configure Settings Dialog to set the Find where options. Type a string in the Search field. As you type the first setting matching the content of the search field highlights. Keep typing typing: the next matching setting highlights as you type. Click the Find Next ( ) or Find Previous ( ) buttons to jump to the previous or next setting matching the content of the search field. The background color of the search field turns green when the final matching setting has been reached. After you find the setting you want, select it to view its current value and properties. If the setting is editable, you can click in the value box to change it. The value options vary depending on the setting. For example, some may require you to enter a number, while others may include a check box or drop-down list. Some settings are grey indicating they’re read-only. In addition, a lock icon ( ) in the lower left corner of the Settings dialog box clearly identifies them as read-only . 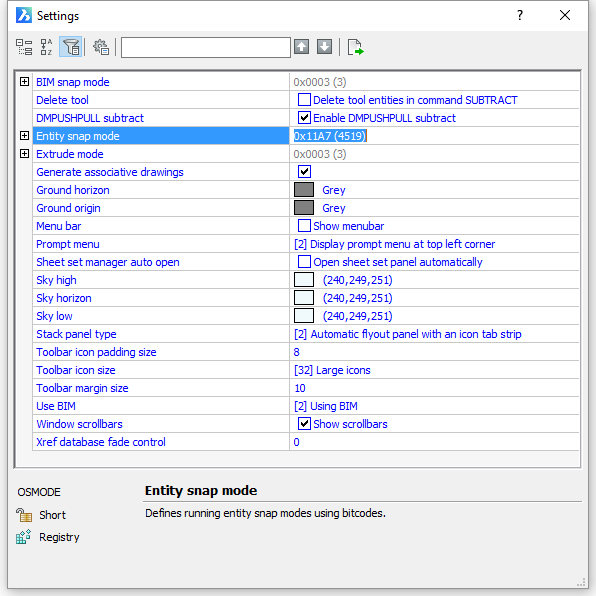 The Settings dialog box offers a graphical and intuitive method for you to view and edit system variables and user preferences. It can be particularly useful if you don’t know the exact name of the variable or if you want to change several variables. However, if you prefer to view and edit variables via the Command line, you can do that too! Simply enter the variable name or launch the SETVAR command. System variable names are recognized by the Autocomplete feature of the command bar if the Exclude the display of system variables option of the AUTOCOMPLETEMODE system variable is not checked. User preference names are recognized by the Autocomplete feature of the command bar if the Display preference variables option of the AUTOCOMPLETEMODE system variable is checked. Regardless of how you view or edit settings in BricsCAD, you can easily export them to a comma delimited (CSV) file. Click the Export icon ( ) then enter the file name and location on the Export Settings dialog box. With the CSV file created, you can open it in a spreadsheet app to easily view all the variable properties. This can be especially helpful for troubleshooting behavior differences between different systems or drawings.